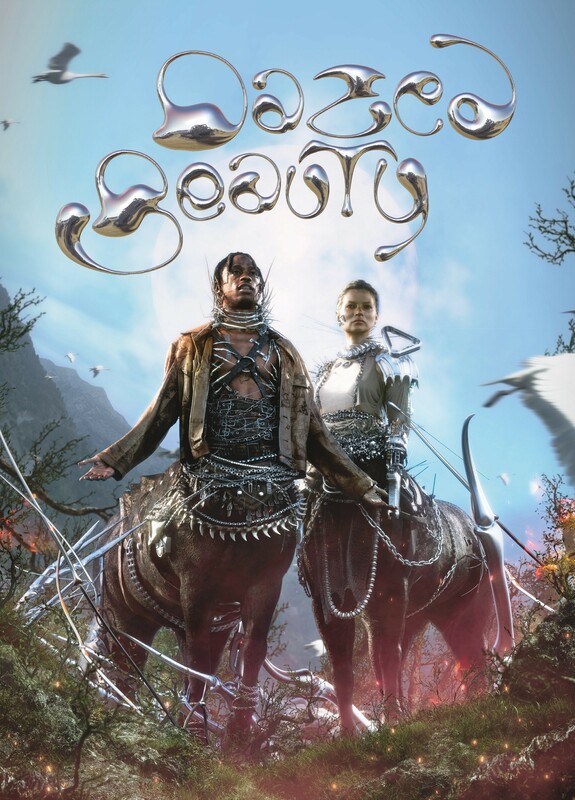 Kate Moss and Travis Scott graced the cover of the first print issue of Dazed Beauty, dressed as apocalyptic centaurs, complete with chain and leather armour. Kate Moss, a global beauty and fashion icon since the 90s and Travis Scott, an experimental and ground-breaking rap artist also star in a ten-page feature: ‘The Children of Ixion’. The story describes the creations as, “weird, electric, Frankensteined together” and is accompanied by images of harrowing metallic monsters. Digital artists, Darío Alva and Travis Brothers, use 3D scanners and CGI to transform Moss and Scott, expanding the boundaries of fashion magazine content. Issue Zero: the future of beauty, merges futurism, fantasy and tech in an extravaganza of dystopian pageantry.